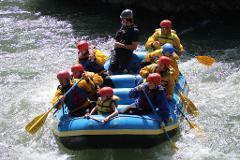 Age 12+ Tieton River Unleashed! Rimrock Lake, just outside of Yakima WA, will be holding back it's water all summer for the autumn release. This means twelve miles of fast whitewater through a beautiful basalt canyon with Class III rapids.